Dave Strand deserves a gold medal for being this long in the tooth with The Strand, his nearly two decade-old, electro-industrial project. 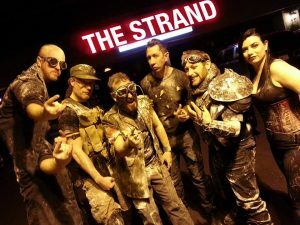 A laundry list of defunct or inactive bands in the Arizona scene would be lengthy, but The Strand have always prevailed with changing trends and other artists calling it a day. Their manic, groove-filled electro has been a prevalent force at the annual Mustache Massacre, in addition to opening slots for the likes of VNV Nation and Imperative Reaction, as well as many other acts that have passed through our stage. 6 years after our initial 2010 Interview with Mr. Strand, we’ve tapped him for yet another chat as The Strand’s upcoming FREE show at .Death’s Friday club night approaches (RSVP here). Read on for more. 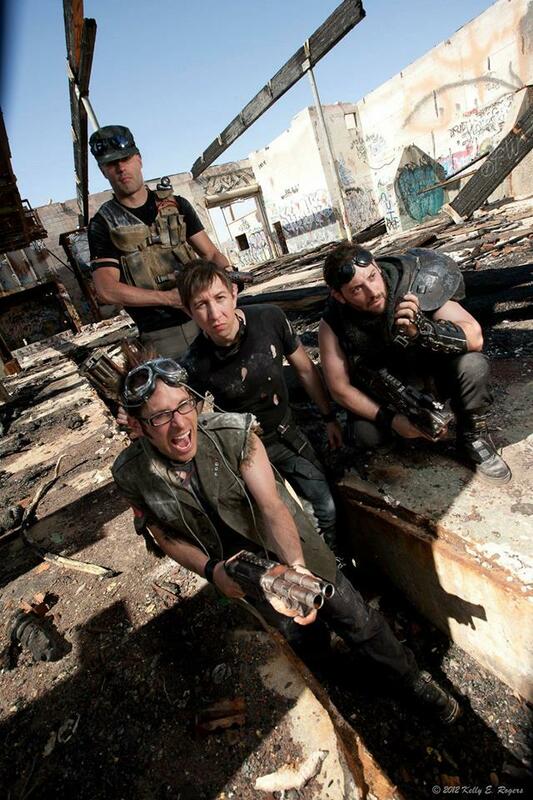 What have you been up to since our last interview in 2010? Holy cow. So much! Let’s see. Got married in 2011 to Kelly, which is going great. And in 2012 The Strand released Combat Advantage, a full length album along with a short post apocalyptic comedy/action film of the same title starring members of The Strand, Hardwire, Black Opz, and Ikonoklast. You can watch the short film on Youtube. Our band had a couple lineup changes since 2010 also, in that Bryon Anderson, our long time drummer left the band and Elias Lewter moved from keyboards to drums. We then re-filled Elias’s keyboard position with Mike Marsh who you might know from the local band Hardwire. So the current glorious lineup is Dave Strand, Laura McQuaig, Scott Levy, Steve Laskarides, Elias Lewter and Mike Marsh. Not long after the Combat Advantage release my wife and I had a beautiful baby girl named Madeline who is now 3 years old. So, now I’m a husband and a dad! Being a parent is the hardest and most rewarding thing in the world for me at this moment. It was transformative at a primal level. All of those clichés that people say about having kids… pretty much all true. Thankfully I have an awesome wife, who it turns out is also an amazing mother. After I became a dad, my priorities shifted to providing for the family, and being a good father/husband. I didn’t have a lot of time for side projects for a couple years, and quite honestly that didn’t bother me much. But now that she’s older I have more time to do music, podcast, and app development. I’m happy to report that I’m back in the studio working on tunes, booking shows, and excited to hit the stage again this coming Friday in Mesa at The Grid! Speaking of your show this Friday 2/12/16 at The Grid. 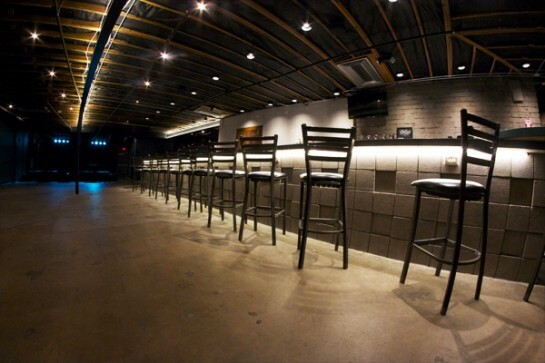 The event, .DEATH, is one of the newer alternative clubs in Phoenix. What do you have planned to make this show special? Yup! Very excited about the gig this Friday! We only had one show in 2015 so the band is itching to get back up there and start playing a lot more shows in 2016. This is our first one in what seems like an eternity so we will be testing the waters to see how it goes. The venue itself is going to make the night memorable. It’s an ARCADE + BAR. or ‘Bar-Cade” as the kids call it. They have stand up arcade games, pinball machines, computer emulators for old game systems, and a fantastic bar serving beer and wine. It also has a very special 10 player stand up game called Killer Queen. I’m told there are only a few in the country. It’s like an updated, upsized, version of Joust, but also tactical, with two teams of five who fight each other… It’s hard to explain. Come check it out. The night we are performing is also the .death monthly club night there, with MERCURIUS FM spinning some great music, and I hear they added a guest DJ Seismichitt. It’s a FREE show, and we hit the stage at 11pm. Your YouTube page is full of interesting videos, including behind the scenes footage. What is your favorite and/or most entertaining behind the scenes video that you have done? Oh! Haha! Yeah, we have a plethora of videos on youtube.com/davestrand. Some feature our friends hanging out and partying, some behind the scenes at concerts or band practice, and some relating to our DnD podcast. Thanks for reminding me! It’s fun for me to look back. Our friends are so talented and funny, I love sharing those experiences. What is my favorite one? It’s so hard to say!! I really like the touring videos. There’s one called “Road clips from The Strand’s 2010 New Mexico gig” which I just watched and smiled ear to ear. It depicts us mostly killing time and joking around en route to a gig in New Mexico. I think maybe the most accurate representation of a day in the life of a musician is The Strand record at GCC and perform at Sadisco. It’s not exactly jam packed with action, but a great fly on the wall kind of video. I think my all time favorite party-time video is the one where a bunch of us go to the clubs which is called 2008 Nov 28 Friday : Tranzylvania, Drining, Dying Hair. I heard you are currently involved with a podcast called “Beer and Battle” with Ryan from Hardwire. What is that all about? Yeah!! So much fun. Beer and Battle is a free audio only podcast where a bunch of us get together and play tabletop role playing games… and it’s true! The Hutman plays too! He’s hilarious. I should warn, the language is NOT safe for work. We play Dungeons and Dragons in the early episodes, and the Pathfinder in the later episodes, which is like an augmented form of DnD. I edit it down, to make the game move along, and sometimes add in sound fx. We started releasing episodes maybe six years ago, and it’s just kind of grown from there. In fact we still get together and record games and have at least 80 backlogged episodes so there’s much more to come! We have a stellar cast of players guys and girls. Most of the episodes feature Peter Hicks as the Dungeon Master, who I consider to be the best DM in the WORLD! He moves the game along, is interested in keeping it fun for everyone, has a great voice, and his improvised descriptors are amazing. Again, I just have hilarious and talented friends and I am happy that they let me share some of our moments with the public. We have a solid following, and have heard wonderful feedback and reviews, from people all over the world who listen on their drive, or at work. We release two to three new episodes a month. Can you tell us about your upcoming mini tour? Not much to report yet. The details are still being fleshed out. But we are stockpiling corn starch, I mean.. “apocalypse powder”. (We sometimes powder up before hitting the stage.) OH! That reminds me.. The band is also releasing a podcast called Apocalypse Powder. Fans of The Strand might want to listen to that. We get together, pick a topic, and discuss. Some of our topics are telling Ghost Stories, Room Service, Concerts we’ve seen..Link? When you are not posting videos, writing music or playing gigs, what do you like to do? I spend a lot of time learning how to program and making Apps for the iPhone. I’ll post some links below. I love the idea of being able to create something from nothing. That is what draws me to art and music. you can make something from thin air, sometimes not even knowing where the idea originates, and maybe someone connects with it. That’s a pretty awesome feeling. A perfect day for me might be. Getting in some exercise like Tae Kwon Do or a good run, Spending the day with the wife and my daughter at the zoo or hiking perhaps, coming home and grilling. I love to grill. I get a glass of Cabernet, put on a podcast like The Nerdist or Stuff You Should Know and grill up some Baby Bella Mushrooms, Asparagus, and some kind of meat. If I’m really frisky, I might coordinate with some buddies and go out and have a beer or go dancing! But let’s be serious.. If I can do even one of those things in a day, it’s a good day. I mean, I do work a full time job as an Audio Visual Technician at a local community college, coupled with my other obligations, that forces me to be really selective about how I spend my time. The Strand is the reason why I starting doing shows, when you asked my band to open for you in 2009. Do you have any tips for newer bands just getting started? One thing I could say, is that you should be pretty clear what your goals are. If those goals are getting rich, getting famous, or getting laid, you might be in for a rough road. Hopefully it’s got more to do with creating or playing music, expressing yourself, or even proving something. Being in a band is also a lot of managing relationships… If you can, choose your friends for band mates. You will be spending long hours together and may be in for turbulent times. You want people who have your back when times get tough and emotions flare. Is there anything else that you would like to plug to our readers? You know. Honestly when I was a kid I had a hard time in social situations. My dad had a book around called How To Win Friends and Influence People by Dale Carnegie. I think everyone should read it. It was written AGES ago.. the 20s? maybe? But it really helped me understand how to interact better with people. I’m certainly not always following his teachings, however it did help me at least identify what I was doing wrong. Since we’re on this topic, I also learned a lot from the Myers Briggs test. I’m an INFJ for those interested. It’s a personality test that also helped me articulate and understand myself. And more importantly that I’m not alone in my own personal challenges. In my early years I was often seeking validation. Now that I’m a bit older, it’s not so much about validation… but I still have the drive to create. I keep pushing myself towards the next goal, the next big thing. Occasionally I look back at what I’ve made and say, “hey, that was kind of cool.” But more often than not, as soon as I complete something it’s all about the next song, the next podcast, the next app, the next whatever.